“How far I can reduce the photographic activity’s narrative while still retaining a body-reading that reveals itself in time?” This was the proposition set out by Suzy Lake that resulted in Reduced Performing (2008–09). 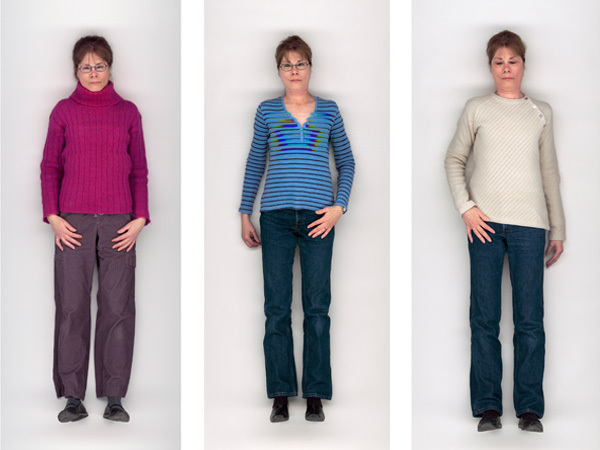 Made on a flatbed scanner, these self-portraits took seven minutes as the scanner traced her body. During this expanded “exposure” she was breathing, blinking, and sometimes crying. Lake chose these involuntary movements because they are generally overlooked and taken for granted. The result produces a strangely still form that is a cross between a stylized catalogue image and a saintly figure descended from heaven. Born in 1947 in Detroit, Suzy Lake moved to Canada in 1968 and is now based in Toronto. Her work has been included in numerous major exhibitions, including WACK! Art and the Feminist Revolution 1965–1980 at the Los Angeles Museum of Contemporary Art (2007), and travelling to the National Museum of Women in the Arts in Washington, D.C., P.S.1 Contemporary Art Center in New York, and the Vancouver Art Gallery; and Traffic: Conceptual Art in Canada, 1965–1980 at the Art Gallery of Alberta (2012), the University of Toronto (2012), the Vancouver Art Gallery (2012), and the Badischer Kunstverein in Karlsruhe, Germany (2013). In 2014 the Art Gallery of Ontario in Toronto will present her major touring retrospective exhibition Introducing Suzy Lake. Lake is represented by Galerie Donald Browne in Montreal and Georgia Scherman Projects in Toronto.